CM-400 & 700 is a worlds smallest, most affordable yet powerful camera of its kind. CMOS cameras uses very little power, can last up to 15 hours on one 9V battery. With a special pinhole lens, these camera can see through a hole measuring no more than 1/8" diameter. Conceal them inside of an object for covert operation and protect yourself and your loved ones. 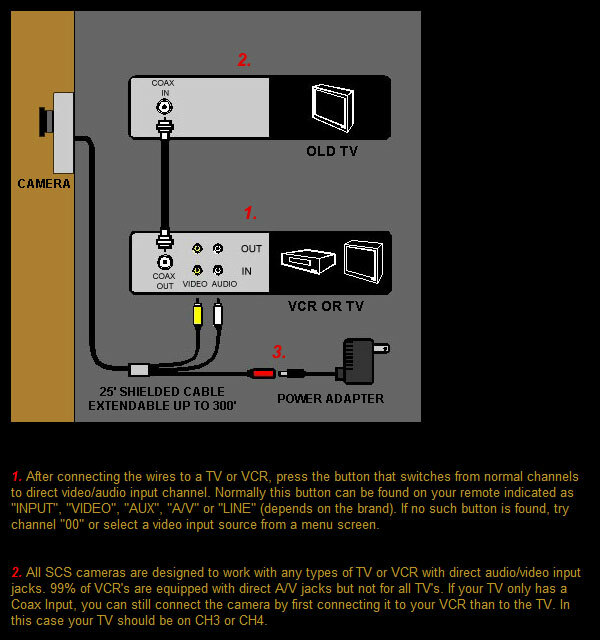 Directly hooks up to any TV, VCR or a DVR. All SCS cameras come in a complete package so all you have to do is just plug it in. Not recommended for very low light conditions, please check our CCD cameras instead. 1/2" size sensor will provide with best resolution & wide angle among the CMOS cameras in the market. Have a specific question about these products? Click Here.